Residents cleared their pantries and congregated at City Hall Plaza Thursday afternoon for Hunger Action Day, a gathering to raise awareness for those facing food insecurity in Boston. The Greater Boston Food Bank and Citizens Bank hosted the gathering for residents to learn how they can help end the hunger crisis in Boston. 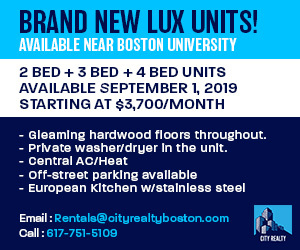 Boston Food Security Fellow Elizabeth Miller said these types of crises can cause residents to experience malnutrition and serious health problems. Miller, who works at the Mayor’s Office of Food Access, said during the gathering that hunger and food insecurity are very real issues for thousands of Boston families and that her office works to ensure all Bostonians have access to the food they need. Miller added that City Hall would be illuminated in orange lighting at night in honor of Hunger Action Day. The afternoon included a ribbon-cutting ceremony to inaugurate GBFB’s two, newly-branded 28-foot refrigerated trucks, donated by Citizens Bank. The trucks can hold up to 44,000 healthy meals at a time to be transported to those in need. Catherine D’Amato, president and CEO of GBFB, said at the gathering that the trucks will deliver over 500 pounds of healthy food and, on an annual basis, five million pounds of food overall. One truck bears the words “to squash hunger” with an image of a squash, while the other reads, “to pear up to end hunger” with an image of a pear. 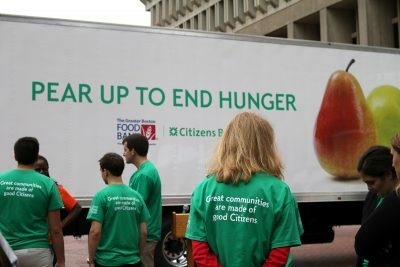 The backs of both trucks read “We’re in it to end it,” referring to the organization’s mission to end hunger in the Boston area. D’Amato said GBFB is the largest hunger relief organization in New England, distributing the equivalent of about 50 million healthy meals to 190 cities and towns and over 500 organizations around Eastern Massachusetts. Rachel Houk Seeger, the VP creative director at Citizens Bank who helped design the signage on the trucks, said after the ceremony that the company partners with GBFB to sponsor the trucks and support the delivery of fresh food to those in need. “It’s a pretty big impact to our community, and it’s a big part of what Citizen Bank supports, which is community and helping not only our colleagues but our community get stronger,” Houk Seeger said in an interview. Jerry Sargent, president of Citizens Bank Massachusetts, said at the ribbon-cutting ceremony that he is proud to work with GBFB to make an impact on the local community. Sargent also said Citizens Bank is matching every donation made to GBFB up to $25,000. At the ceremony, Miller declared Boston Mayor Martin Walsh declared Sept. 13, 2018 Hunger Action Day on behalf of Boston Mayor Martin Walsh. Yesenia Jimenez, 24, of Watertown, said the issue of hunger is important to her because she struggled with being food insecure as a college student. Leran Minc, 32, of Cambridge, said he thinks hunger can be an invisible problem. CORRECTION: A previous version of this article incorrectly stated that Walsh spoke at the gathering, when it was Miller who delivered a speech on his behalf. The current version includes this change. Just to let you know…the mayor was not actually at the event, the speech was made on his behalf by Elizabeth Miller. Also, there’s a minor spelling error in the third graph. Sorry.. I happened to cover the same event and just crossed paths with your story.